Job Openings – We are Growing! During the first dot com boom, harassment—as a mean of eviction—evolved into a business model. Large, corporate landlords began adding to their staffs “Relocation Specialists.” More accurately, these employees were paid thugs, hired to intimidate tenants into moving out. Far too often, these harassment tactics worked. Harassment became so bad that in 2008, San Francisco voters overwhelmingly passed Prop M, an amendment to the city’s rent control law which defined over a dozen practices as harassment, made these practices illegal, and enabled tenants to file for significant rent reductions when being harassed. The last piece—allowing tenants get rent reductions—was especially crucial. But landlords sued and the landlord-friendly courts ruled that the Rent Board does not have the power to reduce rents because of tenant harassment (unsurprisingly to tenants, the Judge who initially ruled parts of Prop M invalid was caught last year harassing her tenants). 1. Expand the list of actions defined as harassment. 2. Give tenants two new avenues to fight harassment that do not require actual damages or attorneys. A. 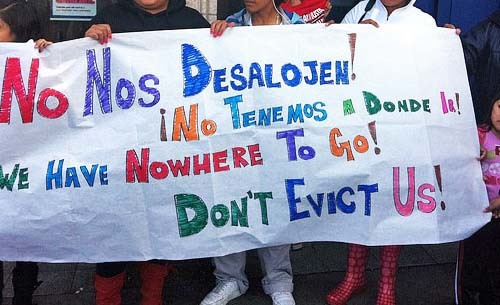 First, harassment will be defined as an illegal eviction attempt enabling tenants to file a “Wrongful Eviction Petition” at the SF Rent Board. The Rent Board will then investigate the allegation of harassment, hold a hearing on the complaint, and issue a ruling. This action is expected to stop much of the harassment as landlords see that city officials are watching and realizing the harassment could lead to action by the City Attorney or District Attorney. B. In addition, the new ordinance provides that tenants can be awarded up to $2,000 in punitive damages for each instance of harassment. C. It also provides that tenants can sue in Small Claims Court to get these awards. D. And finally, tenants will be able to sue after getting the Rent Board decision on their wrongful eviction case, meaning they will have good solid evidence they can submit to the court. The motivation for harassment is eviction, so treating it legally as a wrongful eviction attempt is an innovative and effective way to stop the harassment. The legislation is expected to have its first hearing in either late September or early October. It is expected to pass but could face a Mayoral veto so tenant organizations are organizing to put pressure on San Francisco Mayor Ed Lee, hoping to convince him that the city shouldn’t tolerate harassment by landlords. < Familia Perez: Freddie Mac and B of A, you won’t take our home away!